Autonomous driving is a topic that always manages to hit the headlines. Reports about new attempts, for instance with robo-taxis, simply fascinate us. News items about accidents, like those that occurred this spring, trigger emotional and difficult discussions. Automation of the driving functions presumes that the vehicles are being digitised. This means that the mechanics and the electronics are inextricably connected and the mechanical functions can be expanded with digital functions. These digital functions are called digital services. In the past, digital architecture as the basis of digitised vehicles was characterised by strong decentralisation. Independent decentralised control units were developed for each driving function that was to be automated, for instance, Adaptive Cruise Control (ACC). Modern vehicles at times integrate more than 50 decentralised control units, each of which is developed and produced by a different manufacturer. This has resulted in vehicles with a great deal of complexity. The market is now showing a departure from these decentralised architectures. In the future, the previously decentralised processing will be replaced by a central processor. For example, at Audi in the new A8, this central processor is called zFAS (central driver assistance controller). 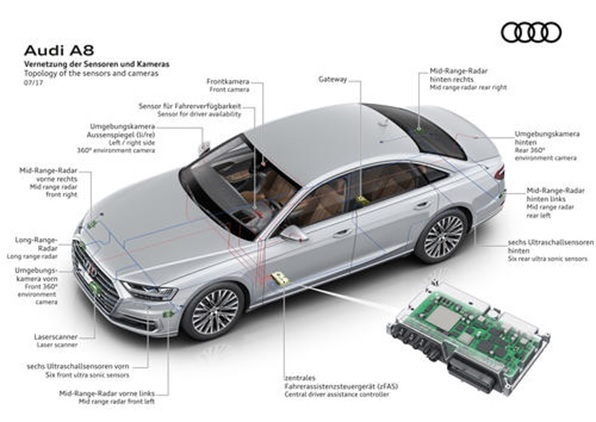 The image below shows the sensors of the new Audi A8 and the zFAS. The data from the many sensors that are integrated into the vehicle are transmitted to the central processor and then assessed. All the data is available at a central location and can be used centrally. The central processor, in combination with a software architecture installed on it, creates the possibility to develop new digital services in the future and to update software either over cable or wirelessly. The primary prerequisite for the development of digital services is the integration of information from as many sensors as possible into a “real world model”. The better and more precise this real-world model is, the better the digital services that can be offered. In the future, for instance, it will be all about consistently bringing information from the cameras, the radar sensors and the LIDAR together into a real-world model. Each sensor has its strengths and weaknesses. When you integrate the information from several sensors, the information density is increased. An integrated real-world model will be the basis of the assessment in the future. A great variety of algorithms, among others also from artificial intelligence, will be applied to this model in order to identify objects and persons and to predict their behaviour. The integration of multifaceted sensors into a model and their assessment in real-time requires major processing capacities (hardware). At the same time, this hardware must match the requirements of the automotive industry when it comes to energy consumption, heat generation and temperature resistance. Automation of the driving process is an important family of digital services. New digital services will be introduced over the next few years, in line with technical development, the change in legal framework conditions and the desires of customers. Ones that will make an evolutionary development possible from level 2 of automated driving to level 4 and at some point to level 5. We will not go any further into automated and autonomous driving in this article since there are already numerous articles on this in the FISITA Blog. Another family of digital services will serve to increase safety. The sensing technology and the associated assessment possibilities will have the effect of a digital co-pilot, which will provide acoustic, optical or haptic warnings when a dangerous situation is imminent. But it can also intervene directly into the vehicle dynamics in order to avoid a dangerous situation, for instance, by braking or steering. In the new Audi A8 – upon the threat of a collision – the crash behaviour is changed through the lifting of the base plate. At the moment, the automotive industry is working on reprogramming the triggering of airbags, for example, on the basis of the new sensor information. Another family of digital services will increase driving comfort. So, for instance, the maximum speed in curves can be limited or a vehicle will only drive curve radii that are perceived as pleasant for passengers. In the new Audi A8, there’s a digital service available that filters out potholes that are recognized by the sensor technology. The suspension is changed in real time. Another family of digital services will generate the forwarding and the reception of real-time information. If in the future vehicles and the infrastructure are to be networked with one another, the vehicles will be integrated into extensive networks or eco-systems. Vehicles will steadily provide a central office or vehicles in their direct vicinity with information about the traffic situation – e.g. traffic jams, accidents or construction sites – or the weather, and they will also receive this information from other vehicles. HERE, a joint venture of numerous large players in the automotive industry created the basis for this type of information exchange with its digital HD cards. In another step, that today – however – is still a long way off, the traffic flow can be optimized for each individual vehicle. The data lab of VW Munich is working on those types of digital services. We summarise additional heterogeneous digital services in the “special applications” family. The spectrum ranges from digital services for handling trailers or mobile homes better to special services for driving on racetracks. And so Porsche intends to offer a special digital service, the so-called Marc Webber app, starting in 2019 that will allow amateur drivers to move on racetracks like the former Formula 1 driver Marc Webber. This list of digital services is neither complete nor conclusive. Only the future will show which digital services innovative brains within and beyond the automotive industry will develop. The possibilities know no bounds. Our examples show that digitised vehicles even today are generating large and exciting quantities of data. This data directly helps drivers, as we’ve shown, with driving their vehicles. Furthermore, this data can form the basis for data-oriented business models. The automotive industry will define which data they will use for the benefit of their customers, which data they need to improve their vehicles and services and which data makes it possible to generate additional business through its sale in anonymised form or together with partners, of course, while adhering to all laws, above all the data privacy laws. The digitisation and networking of vehicles is an irreversible process. Various benefits are being created over and beyond automated and autonomous driving. We are excited to see whether and how the automotive industry will develop from the producers of vehicles to digital service providers and mobility providers. The digitisation of vehicles will, in any case, create a good foundation for this process. 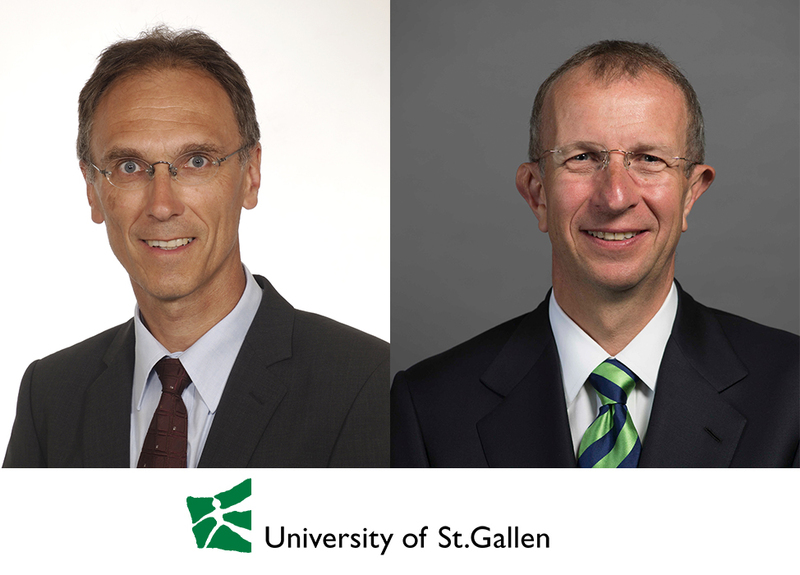 For more information on the future of mobility and digital services in the car, please refer to our book on autonomous driving we wrote together with Audi’s CEO, Rupert Stadler.